OTTAWA -- The federal Liberals are promising to spend more than $250 million to revamp the body Canadians turn to with disputes over access to federal benefits, partially restoring the system that existed before the Conservatives created the Social Security Tribunal. The tribunal hears appeals of government decisions on things like eligibility for employment insurance and the Canada Pension Plan that, before 2013, were overseen by four separate bodies. Key changes included cutting the number of people hearing most cases from three to one, and replacing part-time hearing officials in many places with full-time staff in fewer locations. 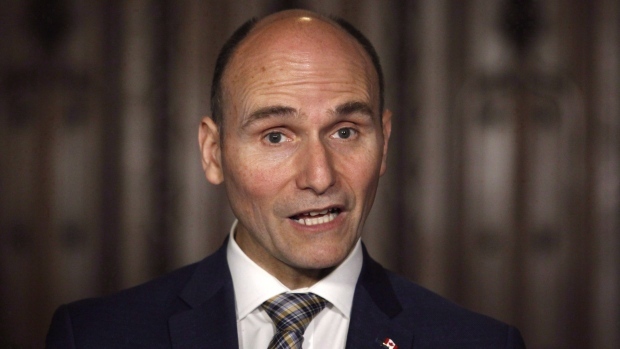 In an interview this week, Social Development Minister Jean-Yves Duclos said the government will bring back the three-person hearings for the first layer of appeals inside the tribunal, and retain the single arbitrator for the second, and final, layer. He says the changes respond to rare agreement from labour and employer groups that some sort of return to the three-panel hearing system was needed. Tuesday's federal budget proposes spending $253.8 million over five years, beginning in April, to make the system easier to navigate and shorten decision times. "It was felt by EI commissioners and the stakeholder communities, both employers and employees, that there was a lack of transparency, and a lack of collaboration in the way in which the system was working," Duclos said in an interview Wednesday. "So despite the fact that it was not in my mandate letter, we did feel that it was important to transform the system and there will, therefore, be a return to a tripartite system -- more fair, more respectful, faster, (and) more collaborative." When the Conservatives unveiled their plans to create the Social Security Tribunal, they argued it would streamline the appeals process and save millions of dollars. A report last year from consulting firm KPMG estimated the tribunal saved federal coffers about $22.6 million a year, but waits for decisions also shot up as the tribunal was undermanned and overwhelmed with cases and didn't have a proper transition plan. Average timelines for decisions increased from approximately 44 days to more than 200, and in the worst case, average wait times of 884 days for decisions on CPP disability benefits that were highlighted in a critical 2016 auditor general's report. What the Liberals heard in closed-door meetings and consultations with stakeholders, labour and employers groups, as well as experts over the last three years were calls for a return to the system as it existed before the tribunal's creation. At the same time, the KPMG report warned against that, arguing the tribunal could be improved, and some who worked in the system felt things were much better than what existed before. "(I)t became eventually very clear to me in conversations with employers and employees -- and I can tell you there was a consensus, which is rare in that environment ... that we needed to transform, to reform that system for all sorts of reasons," Duclos said. "The first was that it was very unfair, very complex and to the most vulnerable workers in our country, it was not only unfair, but also very slow." The tribunal has been changing its operations as officials waited for the budget announcement to publicly detail the future of the tribunal. Appellants can choose whether to have hearings in person, on the phone or by videoconference. Rule changes have also made it easier to launch appeals and wait times have dropped. The backlog of cases has fallen from about 7,250 in April 2017 to 3,925 at the end of last year. The budget shows that there will be $36 million spent on the overhaul over the next 12 months, rising to $59 million in fiscal year 2021-2022, and setting in at $57 million annually thereafter.